Tonight in Detroit will be the first real test for the newly revamped Rangers, as Hockeytown welcomes a formidable foe in New York. Tonight seems to have the possibility of being a terrific hockey game between two teams that have stellar goaltending, highly talented scoring forwards and successful team chemistry. Everyone in the NHL's upper management loves when the two biggest hockey markets come together to play one another; as the TV ratings should be the highest since, I don't know, the last UFC exhibition match? So, back to the whole first test thing. The Rangers have a 6-1 record against teams that are collectively 9-9-1, or 5-9-1 without counting the Sabres. Yeah, that's the hard truth: we are beating teams that we're supposed to beat. The teams the Rangers have beaten by a mere two goals at times are not the teams that are considered "elite". Detroit was the best team in the league last year, and the collective thought among the professinals is that they are aiming to repeat for a second Stanley Cup in as many years. Although, there are those few that believe the Rangers will win the Cup or at least win the Conference, however I don't take advice on the upcoming NHL season from the likes of Mathew Barnaby and a biased ESPN. Indeed the Rangers are on a hot streak, raising some questions as to why coach Tom Renney shifted up the lines at yesterdays practice. However the new lineup that featured captain Chris Drury back at center and Dan Fritsche and Nigel Dawes back in the fold, produced a "W". 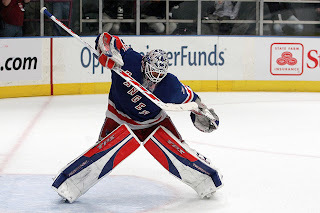 The Rangers didn't get as many shots last night as they usually do, but the defensive side of their game looked stronger then it has in a few games. Tonight though, the Rangers will be facing a team that can break the Ranger defense by the end of the 1st period; maybe having Henrik Zetterberg out tonight with a sore groin will help out our Defense, as the "6 Pack" will have to worry about the likes of Datsyuk, Holmstrom, Franzen and the always dangerous Marian Hossa. It's almost game time and the excitement is overwhelming....Just kidding, but seriously I am looking forward to seeing the Red Wings play. It will be interesting to see how the Rangers match up to the best the Western Conference (and the NHL) have to offer. Enjoy the game and Test #1, hopefully we'll get an A..
Well they passed the test. 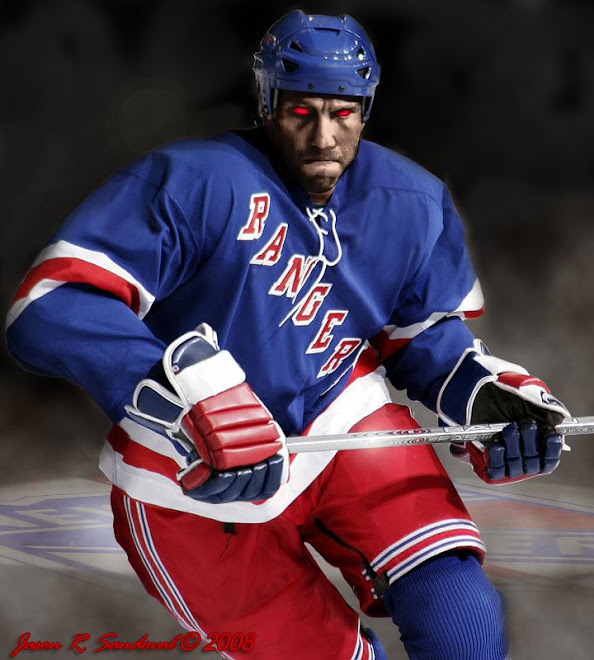 Despite our King Henrik letting a couple of soft goals through and my wanting to chop off Wade Redden's nuts in OT, I'd say our blueshirts rose to the occassion. We will take that important point. They earned it! Where the hell is Aaron Varos and Dubie these past couple of games? yeahh they lost to Detroit, meaning they proved to me that they are up there withj the elite and DO have the potential to beat Detroit and whoever else they play in the furure. I just hope this loss doesnt screw us up, but I'm sure well be fine. They should have won that game. That too many men on the ice call was bull s**t, he never touched the puck. Hopefully they can beat Dallas.